GNOME Translate is a GNOME interface to libtranslate. It can translate a text or web page between several natural languages, and it can automatically detect the source language as you type. 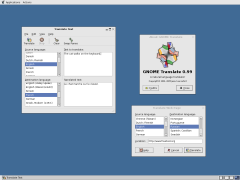 GNOME Translate is free software, released under the terms of the GNU General Public License. GNOME Translate version 0.99, released January 14, 2005. The files are signed with Jean-Yves Lefort's PGP public key. If language detection is enabled, passing a file argument to GNOME Translate may crash the program. A natural language translation library. Copyright © 2005-2007 Jean-Yves Lefort. All rights reserved.